So you might want to grab a bevy. I am having a rose,its normal around here. 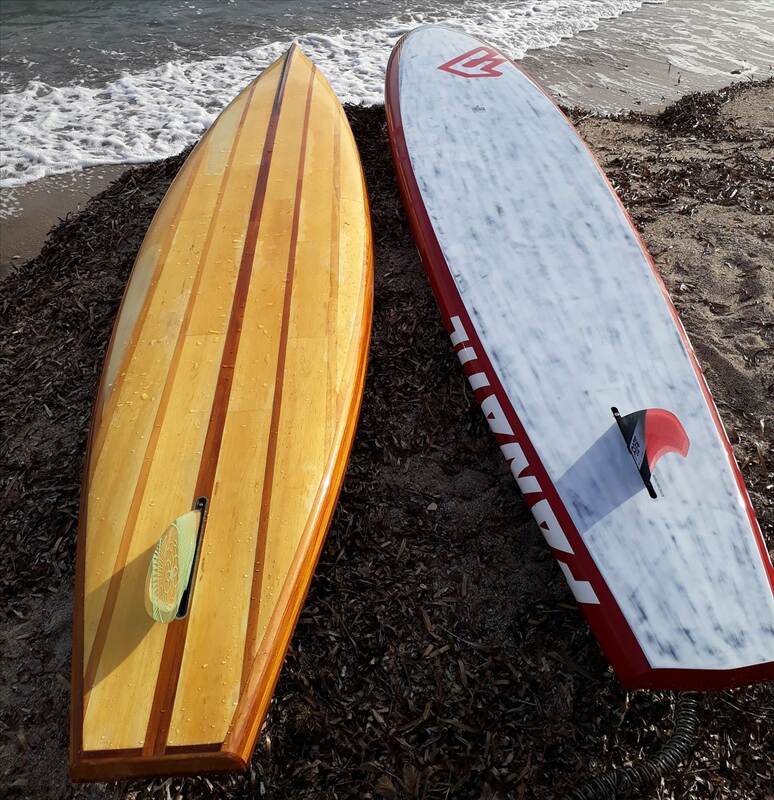 I have been paddling both these boards a bit and getting to know them. So the woody and the other one, for the life of me can't remember what it is! Could they have written it any bigger! One is a dream to paddle in the flat and parts the water and small chop better than moses. The other slaps like, well we wont go there. But once it gets bumpy the red one is so much more stable and faster.Flat bottom vs round bottom. One ways 9.5kgs the other weighs 13.5kgs.Carbon/innegra vs wood. 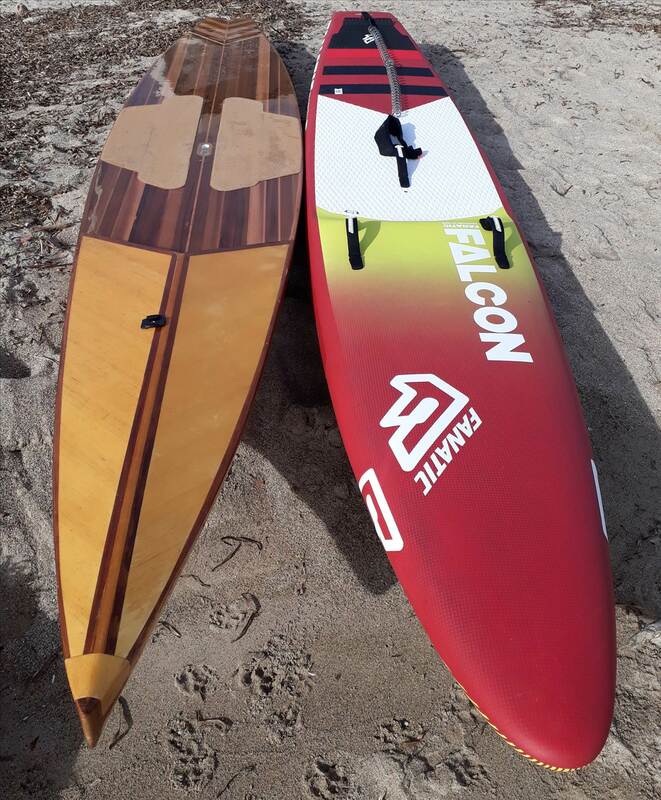 On the 9ish k paddles in the flat the woody is faster on average. Just over 7ks/h average. The red one just under 7ks/h. But wait for it. I get higher top end speeds on the red one! Because its red you say. But I don't think that's why. I don't know why but I don't think it's because its red. So what about downwind I hear you asking. One doesn't. The red one is a dream. Stable, takes off on anything. A little tooo quick sometimes! Straight off the back. That nose that slaps like... becomes a saviour. Move feet,doesn't matter it just smashed through the wave in front and we are still going. O no it's going under,just pops back out. The woody gets more attention. Is that real wood,is it heavy, ect. The red one, well its bloody obvious what it is! I enjoy them both in the right conditions. The speeds I quoted may be wrong as its taken from a mobile phone and the weights are definitely wrong because I used the bathroom scales and my wife swears they are not accurate. Both boards should weigh at least 1 kg less. Good approach and content on this review. What Rose are you drinking??? chevy wooden station wagon vs ,red Ferrari . Helmy, one of the good things about living in France is the rose. 5-7 euros gets you a decent bottle. Don't know what it was to be honest. Beer on the other hand isn't great. If you like Leffe you are OK.
A little vid of the woody. Turn the sound up and enjoy the sound of a hollow wood board. - Leffe is a Belgium brand. - there are now tons of superb beers in France, with all the small breweries that popped up everywhere. My favorite is located 200m from my home: www.lasequere.com/ Search a bit, I am sure you will find wonders close to you. - rose' is OK for tourists, but you should taste real wines :-) Actually, there are good rose's but they are insanely priced due to the hype (e.g. the Ott family). Yes craft beer has exploded in France in the last few years. Some are OK. They are really expensive around here. Havn't tried the one you mentioned. I will keep an eye out.